This guide is designed to provide basic information about iSCSI and practical guidance for planning and deploying iSCSI technology and products. Although this guide contains some iSCSI marketplace in­for­mation and discusses specific vendor products, it is primarily a technical document. It focuses on iSCSI primarily, but not exclusively, in a Microsoft Windows environment and is an updated version of the 150-page Microsoft iSCSI Storage Deployment White Paper that we published for Microsoft in June 2007, which is available on our website. Because iSCSI includes server, networking, and storage technologies, this guide provides information and guidance in each area. 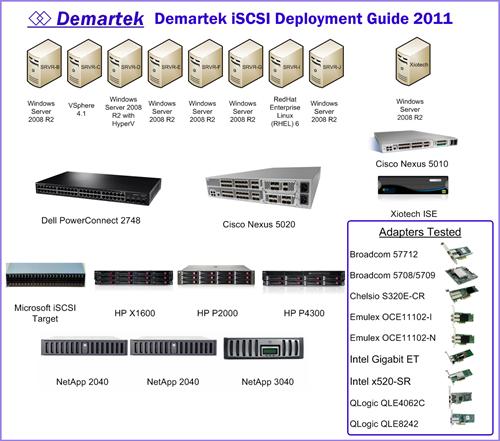 A basic understanding of each of these areas is needed to successfully deploy iSCSI technology. This guide is intended to be used as a reference and is divided into sections including iSCSI marketplace data, iSCSI technology areas, and specific vendor products in the area of network adapters (1Gbps and 10Gbps) and storage targets. There are screen shots and information from actual deployments of these products. Most of the work was performed in the Demartek lab in Arvada, Colorado, USA. The table of contents entries are listed below the diagram. Update 14 July 2011 — During the first 30 days that this report was available, we had more than 1000 downloads of this report.